I've been incredibly busy today...considering I am now on annual leave from work and had spare time aplenty. You see, as of tomorrow I am going away to do my annual stint at the Maze Scripture Union holiday camp... and I still have a mountain of packing to do. 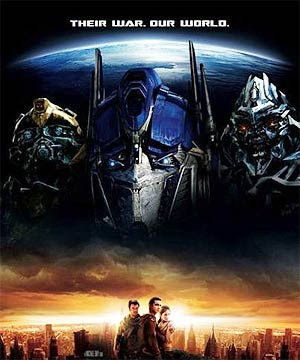 However, I had vowed to myself that I was going to watch the live action Transformers movie before I went away. I was pretty vexed to discover that the local picture house isn't going to screen it until after I get back. So did I admit defeat.... no of course not. I hopped on the bus to Stratford-upon-Avon and transferred to the Birmingham train. By 10:20 I was sniffing out a ticket at the local Odeon cinema (which was just the first one I stumbled upon). I have to say that above all, the film was a lot of fun. Of course it had it's flaws but that's the beauty of it. The film accepts it's own weaknesses and ratchets up it's strengths to compensate(sorry about the pun). Yes the plot is a little hokey, what with robots pursuing a cube of immense power across the galaxy... and the key to finding them being the imprint on a pair of antique spectacles... but the films plus points by far outweigh this. First of all the characterisation is inspired... and you can clearly see Stephen Spielberg's influence on Michael Bay, in using the whole boy/alien bonding set up, as seen before in E.T. - The Extra Terrestrial. You sympathised with the humans... particularly Sam, because it is through his eyes that we are more or less flung into the world of Transformers on a personal level. 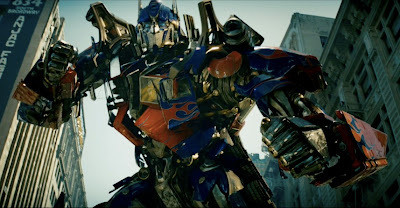 As for Optimus Prime... he is who he always is - a giant robotic John Wayne. He is the Autobot leader and moral compass... and he just wouldn't be the same if he didn't have a n ample supply of noble pontifications to hand. However you have in the grumpy Ironhide a useful counterpoint to this. 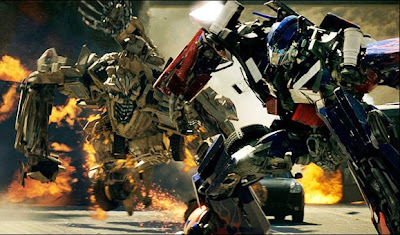 Optimus is pretty much the straight man who the other Autobots bounce off with their different personalities... particularly Bumblebee and Ironhide. Their is plenty of action to whet appetites for a sequel... and ingeniously there was plenty of comedy thrown in. From Sam's robot awkward robot assisted attempts to woo his woman to the awkward confrontation in the bedroom with his parents over what they thought was "Sam's Happy Time", to the Autobots intentionally pitiful attempts at hiding...considering they are robots in disguise. Curiously all this comedy was utterly missed by the Daily Mirror's reviewer, who just tore lumps out of the film. I can only draw two conclusions from this - either he had a complete sense of humour failure/bypass, or he is a complete Simpsons fan boy and was offended that another film should come out the same day as his precious and beloved dysfunctional American family. Don't get me wrong, I love the Simpsons... but that is no reason to be nasty about other films. Most other reviews I have read have been favourable... and my personal experience reflects this. So as long as you are not a complete G1 purist... I really recommend giving it a shot. Rumour has it that the Dinobots will be explored in the sequel... and my hope is that they will follow the comic's perspective of how they came to be... and not the dumb way the cartoon handled it. Especially as the Dinobots were much more rounded and better written in the comics... notto mention the back story having much more credibility. You can make your own minds up by reading this wikipedia link. 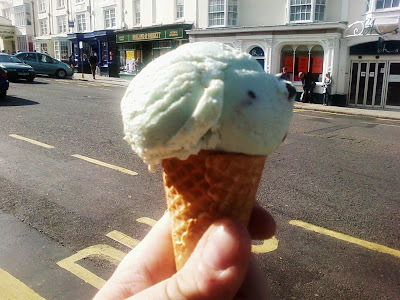 Mint choc chip dairy ice cream! Once back home I started packing... but here I am again having got sucked back to my keyboard! *Sigh* I just can't leave well enough alone... can I? I really must get the rest of it finished though as I am off some time after noon. If I get the opportunity I'll try to fill you in on anything exciting in the week... however it is extremely likely that I will be away from keyboard for most, if not all of this time... and any spare moments will be primarily reserved for recharging my energy reserves (although truth be told I operate pretty much on adrenaline for the whole time I'm away normally). So throughout the next week, I'd really appreciate your prayers, if you can spare them. Hoping to see the film soon. My wife even wants to see it which is a result!